The Super Falcons - Best African Women's Team Ever! Nigeria Super Falcons have retained the AWCON trophy after beating South Africa 4-3 on penalties in the final game played at the Accra Sports Stadium on Saturday. Dubbed revenge or repeat by football pundits, the game was highly entertaining living up to its pre-match hype. Both teams had already met on match day 1 of Group B and it was the South Africans who emerged winners following a late strike in the 85th minute by Chrestinah Kgatlana. The game started on a heated note with South Africa on the front foot and Jermaine Seoposenwe fired the first warning with along rage shot from 25 yards out, but Nigeria goalkeeper Oluehi Tochukwu was equal to the task. Nigeria's Asisat Oshoala responded with a goal bound header two minutes later which was parried to safety by South Africa goalkeeper, Christen Swart. There was no dull moment in the remaining minutes of the regulation time despite the barren score line. 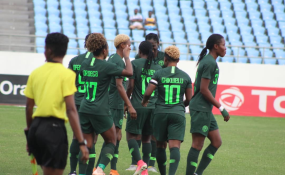 In the 72nd minute, Nigeria had a golden chance to score the opener after South Africa goalkeeper Christen Swart fouled Nigeria's Francisca Ordega in the box and were awarded a penalty. However Asisat Oshoala's kick went wayward. With nothing to separate both teams even after extra time, there came the lottery of penalties and it was Nigeria who converted four of their kicks as against three for South Africa to win the 2018 Africa Women's Championship. The result leaves Nigeria with nine titles (1998, 2000, 2002, 2004, 2006, 2010, 2014, 2016 and 2018). First of all I will like to congratulate Nigeria for winning the AWCON for a record nine times. They have been a power house of women's football for quite a while now and continue to dominate. My team did their best, I mean, we knew that Nigeria was going to come hard at us in the game and they did throughout. We had some early chances that I think we should have buried, but in all it was a very good exercise for us going into the World Cup. The impact we have made at this competition as a country is immense. Last night our president who is in Argentina called us and spoke to the girls and so did other South African officials. The tournament has been very exciting for us as a nation because since we landed, everywhere we went people showed us love and the fans have been amazing so far, just that I feel more can be done to create more awareness for Women's football in Africa. The journey has been good. We came here with the vision of qualifying for the World Cup because we knew it was now poor never and indeed we achieved that. Winning the trophy will have been a bonus but we gave it our all, but you know that penalty is a game of lottery and we couldn't capitalize on Nigeria first. So all in all we are content with our tournament here. It's been a wonderful tournament for us. I must commend the organizers for everything. Everything has been good, the hotels, buses training pitches and even the fans. We are happy with the general coordination. Let me also congratulate Desiree Ellis for a wonderful contribution she has impacted to the current Africa Women's Football. You won a medal and that is a plus for you and your team. The game was very tough in all aspects and South Africa showed character and they did their best to get yet another victory but today our team was more compact. This was the best passing game we've had in the tournament and the defense were alert on the day, so I must commend the entire team for a good job well done. We are happy once again and we will go back, celebrate and start preparing for the World Cup next year. Going forward I think women's football in Africa is fast improving and very soon it will rival the men's competition in terms of support and interest.